The ASPCA recently contacted me and asked me to share information related to its National Dog Fighting Awareness Day Hangout, moderated by Dan Harris, ABC News, taking place on April 8, 2014 from 7:00 p.m until 8:00 p.m. EST. 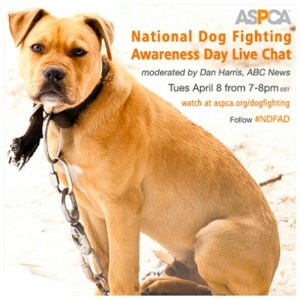 The National Dog Fighting Awareness Day Hangout will discuss with national experts the underground world of dog fighting. The goal is to raise awareness about dog fighting brutality, including the little-known truths about the blood sport and its continuing prevalence in America. In addition to the Google+ Hangout, the ASPCA will be doing live social media questions and answers across Facebook, Twitter and Google+ in which the ASPCA experts will be answering user questions about dog fighting with hashtag #NDFAD. The ASPCA will also premiere a never-before-seen short documentary with undercover footage of dog fights and the rescue activity at dog fighting raids. For more information concerning the National Dog Fighting Awareness Day, please visit here. Please be sure to RSVP today for the National Dog Fighting Awareness Day Hangout!